The year is 934 and Cumbria is in turmoil. The English fight Vikings for political supremacy in the North, whilst the traditional Viking way of life is threatened as Christianity advances against the worship of Norse gods. Against this background, Sigrid embarks on a quest for justice and security for herself and her children. Her only option is to appeal to the King of Norway to reverse his judgement on her father and allow her to inherit the family farm, but Norway is far away and Sigrid is a daughter of an outlaw with only her wits and her sword skills to help her cause. Recruiting a small but gallant force of allies, she sets out to regain her birth-right. During her quest, she encounters kings, warriors and villains. While her fighting skills earn her admiration and rewards, she also begins to understand about duty, honour and loyalty, changing from a headstrong teenager into a respected warrior woman. Shieldmaiden is a well-researched and realistic tale that will appeal to fans of historical fiction, as well as young adult readers. Marianne has been inspired by Nordic sagas and legends and the Icelandic sagas, as well as Frans G. Bengtsson’s The Long Ships, Robert Low’s The Oathsworn series and Manda Scott’s Boudica novels. Dear Buttermere web, I am the author of Shieldmaiden and I was delighted when, some time ago, I discovered the book on your website. 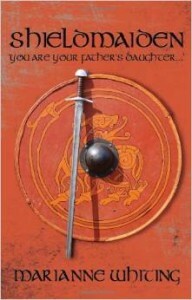 I thought I should tell you that Shieldmaiden is now a trilogy and will be published by Accent Press. Shieldmaiden is re-published on 2nd Dec 2016 to be followed next year by To Save a Kingdom. The re-launched Shieldmaiden is the same book but has a new cover and a new publisher, Accent Press. The present version will disappear from Amazon and be replaced by the new one on 2nd Dec. I would be very grateful if you were willing to change the entry on buttermereweb. Let me know if you’d like me to mail you the new cover. Also let me know if you’d like a link to buttermereweb from my website.